News that West Ham have had a £14.5m bid for Sevilla’s Alvaro Negredo rejected by the Costa Del Sol club, may well have caused Andy Carroll to spit out his Sangria. Negredo signed off a season in which he finished as the Spanish top flight’s highest scoring native with a match-winning four-goal salvo in Sevilla’s 4-3 home win over Valencia and boasts the kind of nose for goal that the Hammers have so sorely lacked in their first season back in the Premier League. 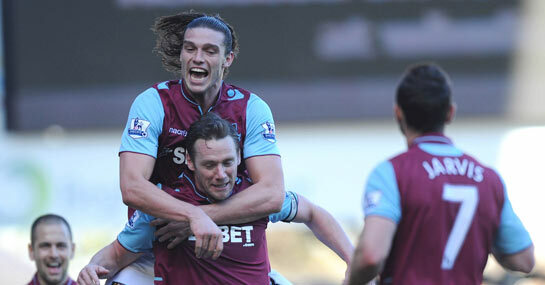 The only player to pouch a double-figure league total for the Upton Park outfit last term was Kevin Nolan, whose form tailed off badly in the second half of the campaign. However Sevilla president Jose Maria Del Nido told the BBC that the Hammers’ offer – less than they have reportedly offered Liverpool for Carroll’s signature – didn’t offer good value and in any case Negredo wasn’t interested in a move to East London. With this in mind the 6/4 on offer about the Spaniard still playing at Sanchez Pizjuan on September looks good value. Carroll started his West Ham career in the much the same manner as Fernando Torres – the striker with whom he will forever be unflatteringly linked – working hard whilst offering precious little assurance that he could relied upon for goals. However seven strikes in his last 16 games in claret and blue hinted that his confidence and eye for goal had merely been lying dormant. Making such a naive offer as their undervaluing of Negredo – who has four years left on his contract at Sevilla – may on the one hand seem a cruel manipulation of the hopes of West Ham’s ardent fanbase, but it may well be shrewd move by the club’s hierarchy if it serves to concentrate the thoughts of Mr Carroll. The towering Geordie received a contract offer from the Hammers two weeks ago, but is thought to be stalling, hopeful of other clubs entering the race to sign him. It’s been suggested that home town club Newcastle have withdrawn their interest in the striker and with no other suitors emerging from the ether his move to West Ham is now being held up by a desire for a £20,000 a wage-hike. Whilst the Hammers are to be admired for their hard but fair stance on the player’s wage demands, a compromise over pay may ultimately have to be reached. Goals will be hard enough to come by in their second Premier League season now other sides know more about how they operate, without losing one of their more potent scorers and with players of the ilk of Negredo uninterested in joining up, tying down the Liverpool man looks a priority. If Carroll refuses to put pen to paper at Upton Park then the 7/1 about goal-averse West Ham – 16th in the division’s goals-for chart last term – going down next season could seem like a generous price.